Emily Ash and Sky Patterson at ASG Senate. After leaving the executive vice president position open, Ash said ASG will continue to operate smoothly. 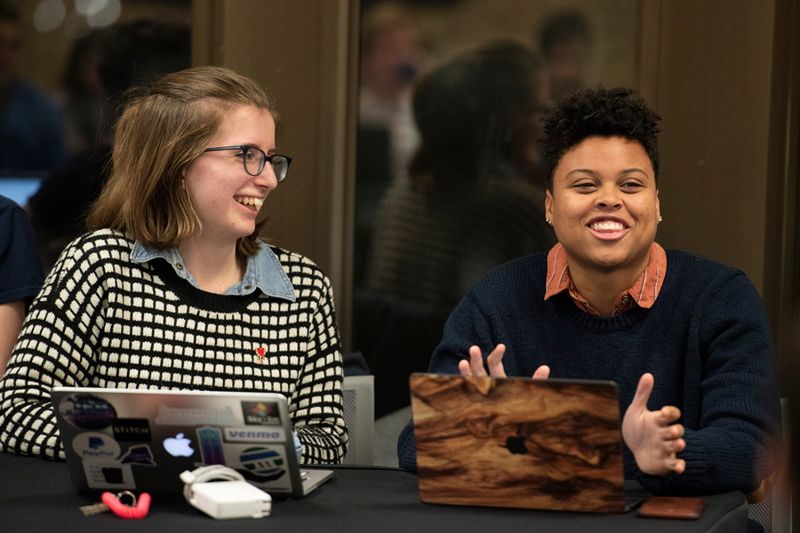 After Sky Patterson, citing her need to focus on health and academics, submitted the first presidential resignation in the last 20 years of Associated Student Government history this past December, the organization has adopted a new leadership structure to work around her absence. Former Executive Vice President Emily Ash stepped into the presidential role, and will leave her previous position vacant for the remainder of her term. Ash has taken on the responsibilities for both positions for the remainder of the quarter. Patterson announced her intentions to resign from ASG on Dec. 16 through a letter to the executive board. In the letter, she wrote that she needed to take care of her physical and mental health, as well as focus on her work and education. ASG Speaker of the Senate Adam Downing said he was involved in the transition process early on. Traditionally, the speaker of the senate would be the one to fill in the executive vice president role, but Downing and other ASG leaders chose to keep Downing in his current role. When deciding how to proceed with the transition, Downing said he had to consider the holistic impact it would have on the organization. While her volume of work has increased since taking on the role, Ash said not having an executive vice president gives her more freedom in how she handles ASG business. Ash said this is the first time the role of executive vice president has been left vacant. Ash added that she has felt well-supported by the ASG executive board and others in her life while navigating her role as president. She said a key to keeping ASG running has been identifying conflicts directly and working with others within ASG to solve them right away. Despite the transition, Ash said she still plans to move forward with the same goals and initiatives she had worked on with Patterson. Ash added that if anything, Patterson’s resignation reaffirmed the importance of previous ASG goals to look deeper into student mental health initiatives.